Deml, R. and K. Dettner. 2002. Morphology and classification of larval scoli of Saturniinae and Hemileucinae (Lepidoptera : Saturniidae). Journal of Zoological Systematics and Evolutionary Research 40(2):82-91. Friedlander, T. P., K. R. Horst, J. C. Regier, C. Mitter, R. S. Peigler, and Q. Q. Fang. 1998. 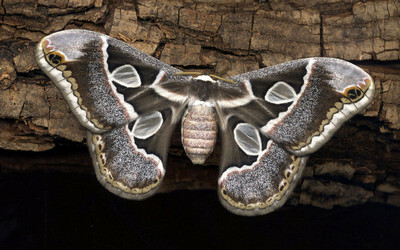 Two nuclear genes yield concordant relationships within Attacini (Lepidoptera : Saturniidae). Molecular Phylogenetics and Evolution 9(1):131-140. Lemaire, C. and J. Minet. 1999. The Bombycoidea and their relatives. Pages 321-353 in: Lepidoptera: Moths and Butterflies. 1. Evolution, Systematics, and Biogeography. Handbook of Zoology Vol. IV, Part 35. N. P. Kristensen, ed. De Gruyter, Berlin and New York. Michener, C. D. 1952. The Saturniidae (Lepidoptera) of the Western Hemisphere - morphology, phylogeny, and classification. Bulletin of the American Museum of Natural History 98(5):341-501. Minet, J. 1994. The Bombycoidea: phylogeny and higher classification (Lepidoptera: Glossata). Entomologica Scandinavica 25(1):63-88. Regier, J. C., C. Mitter, R. S. Peigler, and T. P. Friedlander. 2002. Monophyly, composition, and relationships within Saturniinae (Lepidoptera: Saturniidae): Evidence from two nuclear genes. Insect Systematics and Evolution 33(1):9-21. Shimada, T., Y. Kurimoto, and M. Kobayasgu. 1995. Phylogenetic relationships of silkmoths inferred from sequence data of the arylphorin gene. Molecular Phylogenetics and Evolution 4(3):223-234. Tuskes, P. M., J. P. Tuttle, and M. M. Collins. 1996. The Wild Silk Moths of North America: A Natural History of the Saturniidae of the United States and Canada. Cornell University Press. Zwick, A. 2008. Molecular phylogeny of Anthelidae and other bombycoid taxa (Lepidoptera: Bombycoidea). Systematic Entomology, 33, 190 – 209. World's Largest Saturniidae Site. Bill Oehlke. Saturnia Homepage. Wolfgang Nässig's pages about Saturniidae and other bombycoid moths. Saturniidae of Europe. A. R. Pittaway. John Cody Gallery. 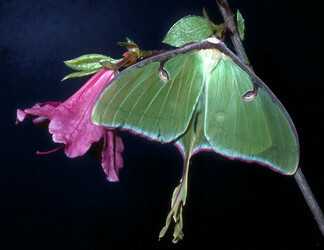 Photographs and paintings of silkmoths. The Kirby Wolfe Saturniidae Collection. Reared from larva collected on Dodonaea viscosa. Page: Tree of Life Saturniidae. The TEXT of this page is licensed under the Creative Commons Attribution-NonCommercial License - Version 3.0. Note that images and other media featured on this page are each governed by their own license, and they may or may not be available for reuse. Click on an image or a media link to access the media data window, which provides the relevant licensing information. For the general terms and conditions of ToL material reuse and redistribution, please see the Tree of Life Copyright Policies.